BNP Paribas Asset Management (‘BNPP AM’) announces the closing of BNPP AM Euro CLO 2018 B.V., a EUR 411.25 million securitisation vehicle that invests in a diversified portfolio of syndicated leveraged loans to European corporates. This is BNPP AM’s fifth new generation CLO (Collateralised Loan Obligation), including three in Europe and two in the US, confirming its position as a major player in the loans and CLO markets. The portfolio consists mainly of senior secured leveraged loans, with the balance made up of unsecured loans, second-lien loans and mezzanine debt or corporate bonds. Six classes of notes are rated by Moody’s and Fitch, and have varying rating levels, enabling investors to invest according to their risk/return objectives. The deal was structured and syndicated by Citigroup Global Markets, with the size increased from an initial EUR 360.25 million following strong support from investors during the placement phase. All tranches of the CLO were successfully placed with a range of institutional investors, primarily from Europe, as well as the US and Asia. Part of the issue was retained by BNPP AM, including the regulatory vertical risk retention, in line with the EU’s Capital Requirements Regulation. BNPP AM Euro CLO 2018 is managed by BNPP AM’s Global Loans team, headed by Vanessa Ritter, consisting of 20 dedicated experts in New York and Paris. It specialises in investing in leveraged loan financing, through managed accounts and CLOs, as well as being a market leader in middle market corporate financing in Europe, having launched the Novo fund in 2013 for French investors. The Global Loans team is part of the Private Debt & Real Assets investment group that was created in 2017 and also includes SME (small and medium-sized enterprise) lending, structured finance, real estate debt and infrastructure debt, as well as the SME direct lending platform. BNPP AM’s Private Debt & Real Assets investment group consists of around 50 investment professionals. 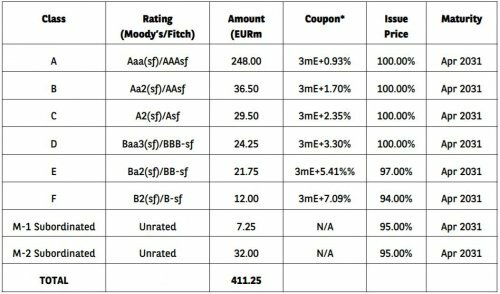 Ratings assigned to notes issued by BNPP AM EURO CLO 2018 B.V.